"Connecting those who know with those who need to know." That is a great definition of knowledge management. And it's right out of the Army manual. The US Army recently released a knowledge management memo outlining 12 principles to encourage and reward sharing knowledge throughout the organization. "Knowledge management is about connecting those who know (know-why, know-what, know-who, and know-how) with those who need to know and leveraging that knowledge across the institutional Army and to contractors, nongovernmental organizations, the other military services and coalition partners,” states the memo. A few months ago I wrote about classifying knowledge as either critical knowledge or common knowledge. Common knowledge is about your experience and what you know. Critical knowledge is about your expertise and how you think. 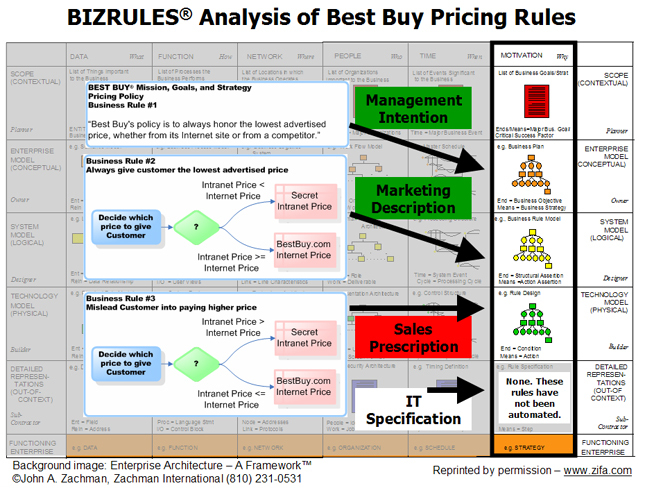 In case you are new to business rules, I’d like to go over a few basic terms and facts about business rules and enterprise architecture. Understanding terms and facts is one of the first steps in the business rules approach. The purpose of the corporation is to perform a business function. The function of most corporations is to make a profit for shareholders by selling products and or services. Corporations comply with external rules, laws, and regulations that specify what the corporation can, should, must, and must not do. They calculate and pay tax, and they report information and file submissions with government agencies. Corporations establish missions, goals, and strategies such as “sell more and increase profit.” They define internal business rules, policies, procedures, processes, and flows to support the strategies while assuring regulatory and statutory compliance. They put in place business rules to guide macro and micro decision-making and help management plan, manage and improve the operation. Corporations open stores and branch offices in places and jurisdictions that they would like to do business in, and where customers can go to shop, buy, and transact. They hire employees and educate them on the goals and processes, and train them on the rules. Corporations design, build, use, and manage information systems, business systems, and database systems for managing, transacting, reporting, decisioning, advising, and automating business functions. These systems have a business purpose, function, structure, behavior, and logic. All these elements that make up the corporation can be represented by an enterprise architecture framework. One influential and compelling concept of enterprise architecture was defined in the 1970s by John Zachman when he described his Framework for Enterprise Architecture. The Zachman Framework (click to see it small, medium, or large) consists of descriptive models that describe all the elements of the corporation and the business models of the corporation. The elements of the corporation include shareholders, employees, and customers (who); data, information, and systems (what); events, plans, schedules, and flows (when); locations, stores, offices, domain names, and networks (where); processes, programs, and code (how); and goals, strategies, policies, and business rules (why). The business models (i.e. views or perspectives) of the corporation are contextual scope (planner view); conceptual business model (owner); logical system model (designer); technology model (builder); and detailed specifications (sub-contractor). Business rules integrate and align all the elements and business models of the corporation. Enterprise rules architecture ensures that the functional and structural components of the business rules required for the corporation to fulfill its business function will work, change, and last. Business rules management entails the business rules approach, business rule methodologies, best practices, rule harvesting, rule modeling, business rule engineering design objectives, enterprise architecture, enterprise rules architecture, rulebase architecture, terms glossaries, semantic modeling, business rule engines (BRE) and business rules management systems (BRMS). Here's a great way to decide which rules belong in the rule engine and which rules could be hard-coded. The idea is that rules that you have no control over, such as compliance rules, must be rule-based so you can react quickly and implement them as soon these rules are changed. When a regulating authority tells you when the new rules become effective, you have no control whatsoever, and a rule engine enables you to change fast. Rules that you control, where you can take your time and decide when the rules shall become effective, can be hard-coded if so desired. There still may be benefits to rule-basing these rules, but at least you can hard-code them if necessary. Idea credit to Paul Ulshafer. See PowerPoint slide of this idea. I'd like to wrap up my blogging for the year with a couple of thoughts that I'd like to explore further next year. The business rules analyst is focused on separating rules from code. The rule analyst walks and talks business. He or she talks about business terms like customers and products and prices and services and business strategies and rules and policies and procedures and functions and rules and responsibilities and authorities and operations and conditions and action. The rule analyst talks about business rules and business logic. The rule analyst means business. The business analyst sees rules as code. The business analyst talks about the system. A business analyst is often a systems analyst by nature, and by training. The systems analyst talks about program fields and screen fields, tables, user interfaces, primary keys, referential integrity, and code. When they talk about conditions and actions, they're often talking about what action to you take when the user pushes this button or that button on the screen. The systems analyst talks about program rules and program logic. They talk about the data access layer, and the bits and the bytes. The systems analyst means code. Most Subject Matter Experts I know will tell you that they are sick and tired of having IT systems analysts come in and ask them the same questions over and over again. A good business rules analyst will ask that question once, and write it down once and for all. I know it's confusing, and I can understand why some companies that are new to business rules think all they need is a business analyst to do rule harvesting. Maybe it's the title of business rules analyst or business rule harvester. I don't like any of those titles, because they leave out one of the keys to success with the business rules approach and business rule technology: knowledge. Back when business rule engines were called inference engines or expert systems, we used to have knowledge engineers. The knowledge engineer would handle knowledge acquisition, knowledge representation, and knowledge engineering. Three things you miss when you use a business analyst instead of a knowledge engineer is knowledge acquisition, knowledge representation, and of course knowledge engineering. You also miss discovering and retaining the knowledge about the rules and the knowledge behind the rules. You miss the knowledge about what rule to use when and why. You miss the knowledge the experts have and need to use in order to figure out what the rules are. The good business rules analyst, or knowledge engineer as I like to call them, elicits this invaluable knowledge from the experts, digitizes it, and memorializes so it cannot be forgotten. 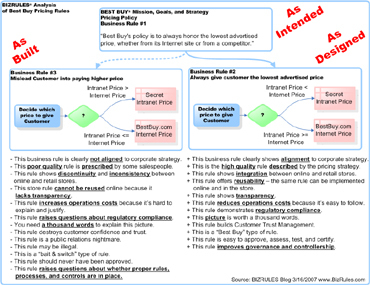 If you don't use a business rules analyst (i.e. a knowledge engineer) on your business rules project, you won't capture the true business knowledge, and you won't get all the business rules. You will get lots of computer program rules, and you will increase your risk of failure. Companies often run into trouble when they try to use business analysts instead of business rule analysts to define their business rules. That's when they call BIZRULES. We help them get back on track with the business rules approach, methodology, and technology. In many cases, the client's business analysts have invested a lot of time writing use cases, and everyone thinks that the business rules would be in the use cases. Eventually the client discovers that use cases are useful for designing object-oriented systems, but they're really not that useful for defining business rules. That's one problem. Another problem is that the business analysts are often really systems analysts with a new title. They are coming at this from the systems point of view, from the code perspective, from the technology side, not from the business side. But the biggest problem is that most companies do not know what the business rules are. There is no rulebook that tells management what the rules in the existing system are, or that tells IT what the business rules in the new system should be. Companies decide to use rules technology because the rules change often and because they see a lot of value in enabling the business people who make the rules to actually write the rules in the system. Once they leap into the business rules side (is that the dark side?) companies realize they need a rulebook with the rules of the business. They have specs, and lots of good documentation, but they usully don't have a rulebook that you could use to author the rules into the rule engine. So they need to go thru the rule harvesting phase of the business rules approach. 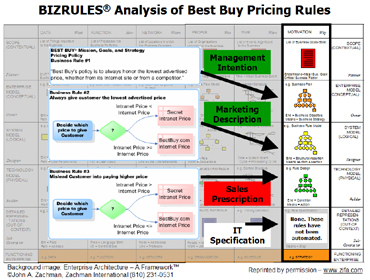 Some companies new to the business rules approach consider using business analysts (i.e. systems analysts) instead of business rule analysts (i.e. knowledge engineers) for rule harvesting. That approach works for traditional IT-driven procedural hard-coded applications. But for leading-edge business-driven declarative rules-based applications, traditional business analysis and systems analysis techniques are probably not going to work. Knowledge engineering techniques and business rules analysis techniques, however, will work. I believe there is a very significant difference between a business rules analyst and a systems analyst. 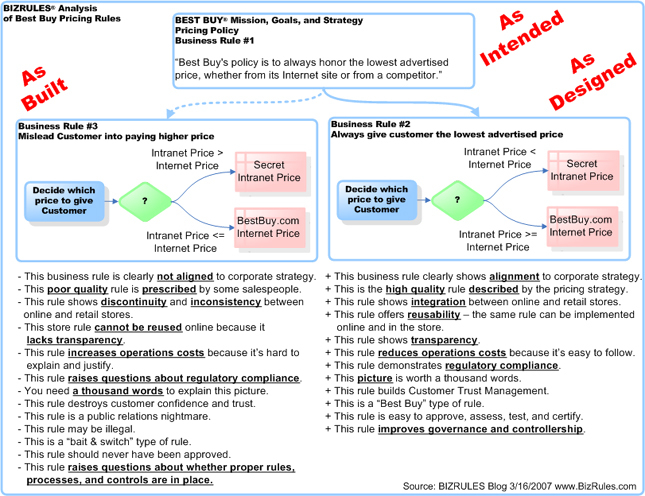 The rules analyst wants to define the business rules separately from the code. He or she wants to store the rules in the rules engine. Their objective is to write rules for rule engines. The systems analyst sees rules as code. They want to embed the rules in the program code. Their job is to document the rules so they can be hard coded in whatever language the programmers are using. There's a lot more to it than that, so I'd like to continue the discussion next year. Meanwhile, I'd like to hear your thoughts on this topic. What do you think is the difference between a rules analyst and a business analyst? Have a happy and safe New Year's Eve. And best wishes for a great new year!